I made this 86-word sight word list for an older student with a good sight word memory. He did not recognize many of these words upon sight, so had to sound them out. Therefore, the list is ideal for decoding practice for older kids! 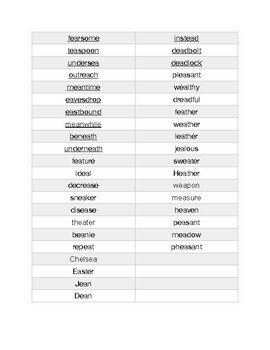 NOTE: The list includes a few words with prefixes and suffixes. 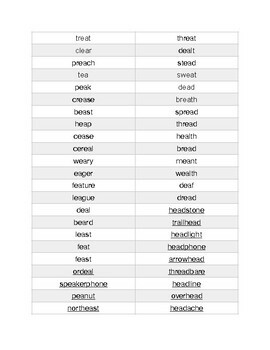 * The left column contains words where ea makes the long e sound. They are organized by 1 syllable words, compound words, 2 syllable words, and people's names. * The right column contains words where ea makes the short e sound. They are organized by 1 syllable words, compound words, and 2 syllable words.